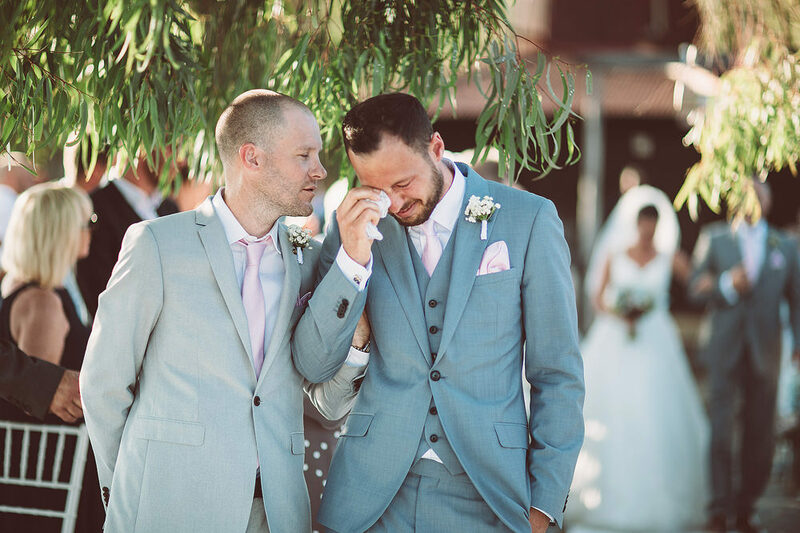 This Italian destination wedding is so beautiful. 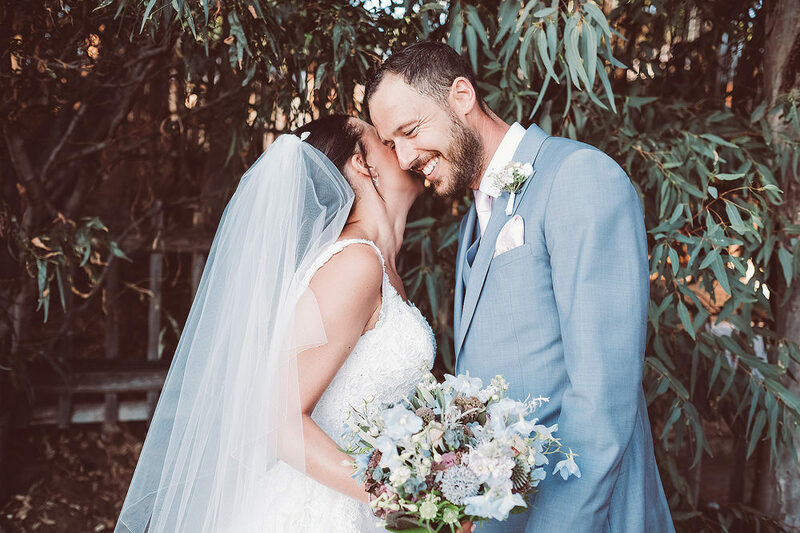 Set on the top of a hill overlooking the mediterranean sea with the gorgeous Sicilian views as the backdrop, it definitely takes your breath away, no wonder our gorgeous couple chose to marry there. 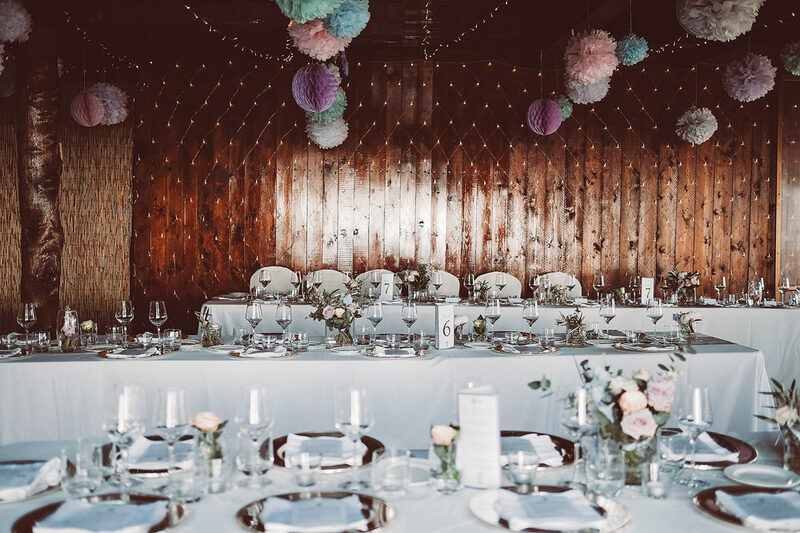 Decorated with twinkling fairy lights, pastel pom poms and delicate blooms The Il Faro venue looked just as magical in the evening after the sun had set as it did in the day when the sun was shining. Also taking my breath away is Nadia in her Essense of Australia gown. She looks an absolute vision and every bit the princess bride, no wonder groom Darren got emotional when he saw her walking up the aisle. All that lace and tulle literally makes my heart sing. Both of them are ridiculously adorable and full of smiles with many more lovely moments between them and guests captured by Lemonade Pictures to pour over & pin. Nadia the Bride: We had imagined our wedding to be a magical outdoors wonderland, full of shimmers and sparkles and that is exactly why we chose this unique venue. We were able to decorate Il Faro entirely how we had envisaged using the amazing back drop of the sea as the focal point. 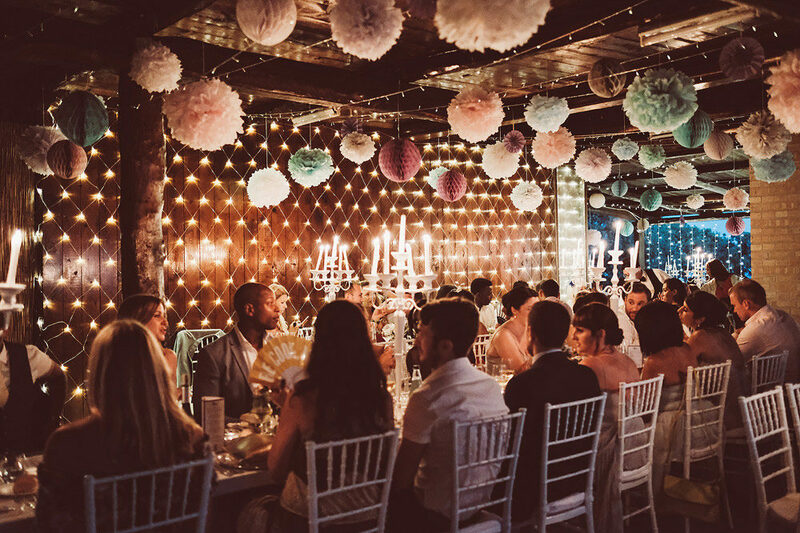 We decorated the entire area with hundreds of fairy lights and lanterns, pastel coloured pom poms filled the dining space and the spectacular “LOVE” sign was the center piece for the dance floor. The first time we visited the venue we were completely won over by the stunning views and made our decision to get married abroad an easy one. We wanted to ensure that we had guaranteed sunshine in an area which would allow our guests to join us for a three-day event to celebrate our marriage. With this in mind we planned a Welcome BBQ the night before the wedding, as well as brunch on a nearby beach the day after to say a big thank you to all of our guests who had travelled from all over the world to share our special day. Our ultimate aim was a huge party and we most definitely had that. The 4am finish, incredible DJ set and sound system, along with the after party and skinny dipping in the pool back at our hotel, will be something we all talk about for years. Many locals commented on the wedding as they had heard the party across the entire bay. The food was absolutely key for us and it didn’t disappoint, with many of our guests thrilled with the exceptional quality and sheer amount of fresh and fabulous Italian cuisine we offered. My wedding dress was exactly what I had dreamt of, designed by Essense of Australia (D1919). I felt every bit the Princess with its stunning sparkle detail bodice, full tulle layered skirt and beautifully elegant train. I had some slight alterations done in order to make the straps thinner and back lower, ensuring I stayed cool in the warm Italian sunshine. I decided to have a short simple veil so as not to detract from the detail of the dress. Angelica Bridal was an amazing boutique bridal shop, who supported me throughout the whole process. My Jenny Packham hair comb was my something borrowed, bringing a bit of sparkle to my simple up hair do. Darren decided he wanted to wear a light weight, light blue/grey 3-piece suit, and so the search was on for somewhere that did exactly that. He eventually found the Milan suit from Reiss where they tailored it to fit him exactly. He was so happy with his suit and it complemented the colour themes of the wedding perfectly. 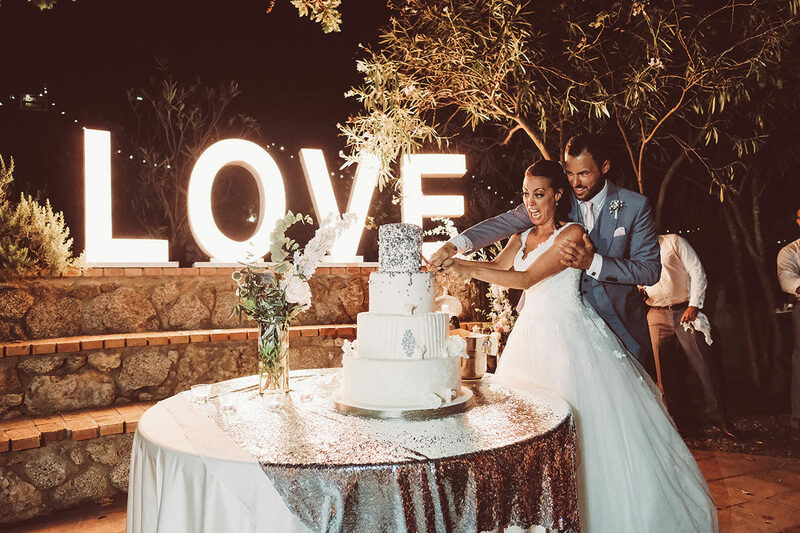 Il Faro: A true one of a kind venue, perched on the top of the Capo Vaticano cliff tops looking out towards Sicily and the Eolian Island – just breathtaking! It’s charmingly rustic and a great versatile space for a wedding. It is family run, they have loved and kept the rustic fabric of this venue alive for over 30 years, and are extremely flexible as to how you wish to use the space, making it feel like your own. The setting is why we choose the venue; it changes as the day goes on making it an awe inspiring wedding background nothing like you have ever seen or experienced before. During the day time you get to soak up the views of the crystal waters, the beaches, the blue skies; the sunset hour is simply magical when the sun disappears behind the Eolian Island, with Stromboli (an active Volcano puffing away). In the evening the sky fills with stars, with the working lighthouse next door throwing strobe lighting on to the party. 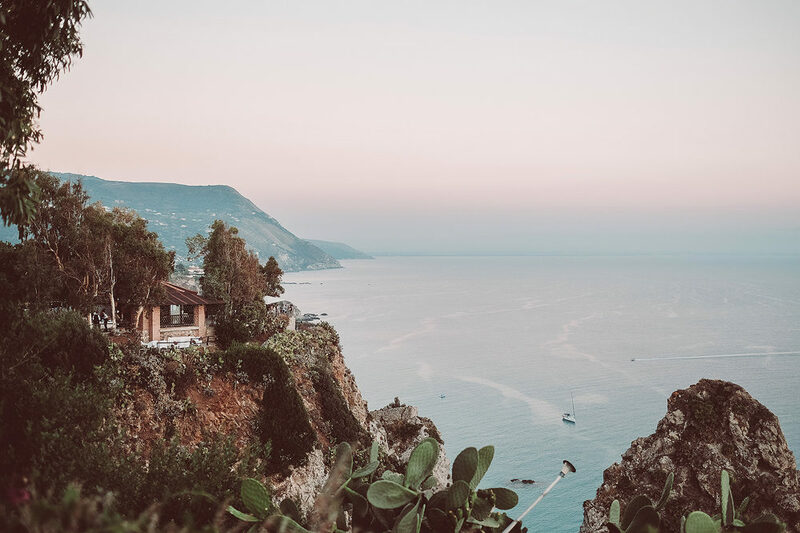 Our guests had never been to Capo Vaticano but so many commented on the breathtaking beauty of the area, but the real crown jewel is the Capo Vaticano cliff top on which Il Faro is perched on; the venue only allows a few weddings per year but it is a guaranteed WOW factor!! Absolutely stunning, we couldn’t be happier with our choice of venue. 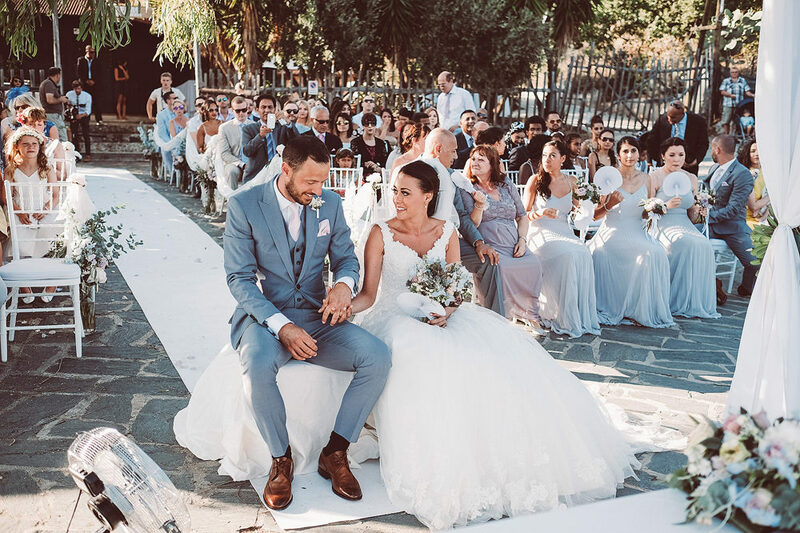 Emma de Cassan provided a full service of wedding planning from translating all the Italian information, arranging accommodation for our guests, helping with making decor choices, dealing with suppliers and arranging transport. She also saved us a huge amount of time arranging a team to also put up the decorations we had brought from the UK. She made everything simple, giving us the time to reach our wedding day stress free. She has a super positive can-do attitude, which was a great support throughout the 9 months of organising our wedding. We opted for a pastel colour scheme. I had visions of all the mints, lavenders, baby blues, pinks and light greys all complimenting each other perfectly. Keeping it bright and summery. Our Florist Gianni Cortese is a very talented florist from the local region, he understood what we wanted through our meetings and the mood board we had created via Pinterest. He created the soft pastel look we wanted, building on our ideas, adding his own person twist. He also provided lots of lanterns dotted throughout the venue, and the show stopping “LOVE” sign which made the dance floor area. Sorting the dresses for my bridesmaids was a difficult challenge as I had 6 in total, all different shapes, sizes and skin tones. I wanted them to all feel comfortable and relaxed and due to the warm weather it was important they had free flowing and light material dresses. I also had 2 pregnant bridesmaids (5 & 7 months gone) so I needed to ensure that the dresses we picked would also be suitable for their growing baby bumps! 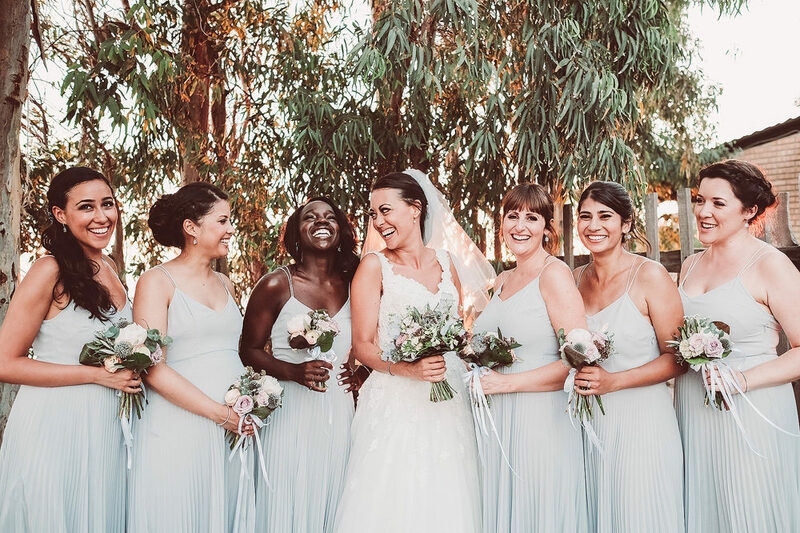 We found the ideal, light grey, simple yet beautiful pleated dress from the ASOS bridal range which suited them all perfectly. Our flower girl wore a beautiful dress from Marks and Spencer. Taking Darren’s niece shopping for the dress was such a lovely day out. She was so excited and looked absolutely beautiful in it. To make life easier for everyone we decided to make our marriage legal, 2 weeks prior to our wedding, in the UK. This was an intimate service held at our local Registry Office and was only attended by our immediate family. This allowed us to have a symbolic wedding ceremony at the venue (rather than the local Town Hall) and meant we could get married at the top of the stunning Capo Vaticano cliff overlooking the sea. We had full input in to the words read by our celebrant. We wrote our own vows and asked my brother and Darren’s sister to both do readings. This was a really special moment, as they had kept the readings as a surprise for us on the day, adding to the emotion of it all. Violin, Harp and Opera Vocalist Sharon and the ladies came highly recommended and no surprise; they are very talented! They provided the music during the ceremony which complimented the beautiful setting perfectly. They also played more contemporary pieces during the canapes and welcome drinks. They were so lovely to work with and really accommodating, even finding the music score to accompany the song I walked down the aisle to (Latch (Acoustic) by Sam Smith). Our DJs, local based Alessandro Mamone and Massimo Pugliese, are really talented and ramped up the party atmosphere throughout the starter buffet, sit down meal and all night on the dance floor. They played an eclectic mix of Motown, contemporary hits and classic dance tunes and were really accommodating when it came to picking our must play songs. They also provided the most incredible sound system and strobe lighting which really added to the party atmosphere. was delicious and in true Italian style not for the faint hearted. It all started with welcome drinks and canapés; followed by a huge and delicious antipasti buffet, with different Islands – meat, fish, cheeses, breads, and a grill and marinated station. It was truly abundant and delicious; the guest thought that was the dinner…. we then moved to the sit down 3 course meal – including the fresh fish menu in honour of us being by the sea. The menu included lobster spaghettoni, tomato, scallop and prawn ravioli and fresh sea bass with basil and king prawn. This was all topped off by a delicious and magnificent dessert buffet which included 40 different types of sweet treats and patisserie items as well as our 3 tier lemon drizzle and buttercream wedding cake, which was stunningly decorated and exactly how we imagined. Once we had chosen our venue in the December, the photographer was pretty much our next decision. Our friends had used Lemonade Pictures for their wedding photographs and we absolutely loved their relaxed, natural, documentary style. When we spoke with Nichola she put us both immediately at ease, and it was the same on the day. We didn’t want anything formal at all, just people being themselves and enjoying the day, which is exactly what Nichola and Marcus did! They were both great and we loved chatting and laughing with them on the day! They captured everything perfectly, ensuring we’ll be able to remember our beautiful wedding and all the special memories forever. Enjoy every second. Embrace the madness as well as all the warmth and love in the room. But most of all remember it’s your day so spend as much time with each other soaking it all up. It’s true what they say about it being all over far too quickly…..